Project obstacles and solutions: In July 2014, Butler University announced that it would build a five story mixed use retail space and parking garage. The structure would occupy space between Hinkle Fieldhouse and Clowes Hall and would contain over 1,000 parking spaces with 15,000 square feet in retail space on first floor. Keystone Group was selected as the general contractor and Midwest Form Constructors did all of the concrete work. 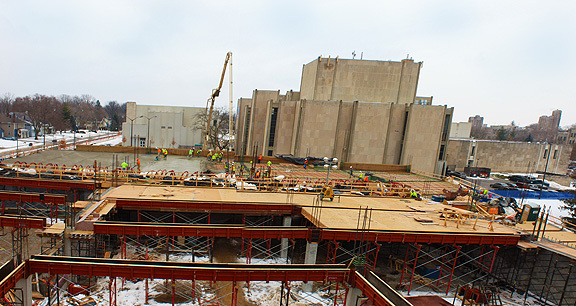 Most of the concrete was poured and finished during the cold weather of winter. The job was specified to be built using post tensioned decks and rebar on eight inch centers. The concrete had to meet early strength of 3,000 psi in 24 hours so the tendons could be stretched. The water-to-cement ratios were critical to set times. So was the ambient temperatures. IMI designed a 5,000 psi, high performance mix for the decks. It incorporated a super plasticizer to keep the w/c ratio low to achieve early strength requirements. In the coldest temperatures, a non-chloride accelerator was used to keep set times consistent. IMI QC/QA also added high doses of corrosion inhibitor to protect the integrity of the steel. In total, IMI supplied 14,000 yards of concrete for this project. The parking garage is on target to be opened by the end of the summer, with retail operating the beginning of the new school year. For more information on performance concrete, contact the IMI sales representative nearest your location. Click here.